These were two back-to-back cruises to the Caribbean from Cape Liberty, New Jersey for a total of 24 days. The ship called at: San Juan, Puerto Rico; St. Maarten; Antigua; Martinique and St. Kitts. (See slideshow of Anthem in these ports). I have become quite attached to Anthem of the Seas. She is unique among the Royal Caribbean fleet. Her two sister ships, Quantum of the Seas and Ovation of the Seas are now aimed at the Asian and Australian markets and thus Anthem is the only Quantum class ship serving the North American market. Several of the key people who developed Celebrity Cruises' Solstice class ships came over to sister brand Royal Caribbean International to develop the Quantum class. Not surprisingly, the interior décor of Anthem's public rooms and staterooms has the upscale flavor and sophistication of the Solstice class. There is no Las Vegas glitz here. Built by the same shipyard that built the Solstice class, you also have the attention to detail and workmanship that is the hallmark of the Meyer Werft yard in Germany. In short, you have Celebrity quality at Royal Caribbean prices. Yes, this is the ship with the bumper cars and the sky diving simulator. However, the amusement park is confined to a relatively small area at the top rear of the ship. It is easily ignored. I can only speculate that Royal felt that it needed such things to grab headlines and to attract action-oriented families. However, only a small portion of the guests actually seem to use these features. Anthem has also been the subject of some negative headlines. In the winter of 2016, she was caught in a big storm off the East Coast and had to return to her homeport. Accounts of this incident have been wildly exaggerated and there was much criticism of Royal Caribbean. However, officers from other cruise lines have told me that the storm in question was much worse than predicted and that what happened to Anthem could have happened to anyone. Furthermore, the ship returned safely to port without significant damage or loss of life. The biggest change to Anthem since my last review is the end of the Dynamic Dining system. Dynamic Dining was an innovative system developed for the Quantum class ships utilizing four main dining rooms, each with a different decor and a different dinner menu. If a guest wanted to have Asian food one night, he or she could go to the Silk restaurant. If he or she wanted edgy novelle cuisine, he or she could go to Chic. For a formal dinner in the tradition of the ocean liners, there was the Grande. Lastly, American Icon offered familiar American comfort foods. During a cruise, a guest could go to each of these restaurants, as many times as the guest wished. There were no table assignments or set dining times. Unfortunately, when the system debuted on Quantum of the Seas, the technology needed to make the system work did not cooperate and there were operational problems. These were eventually solved but the system proved too innovative for many guests, too different than what they were used to on other cruise ships. 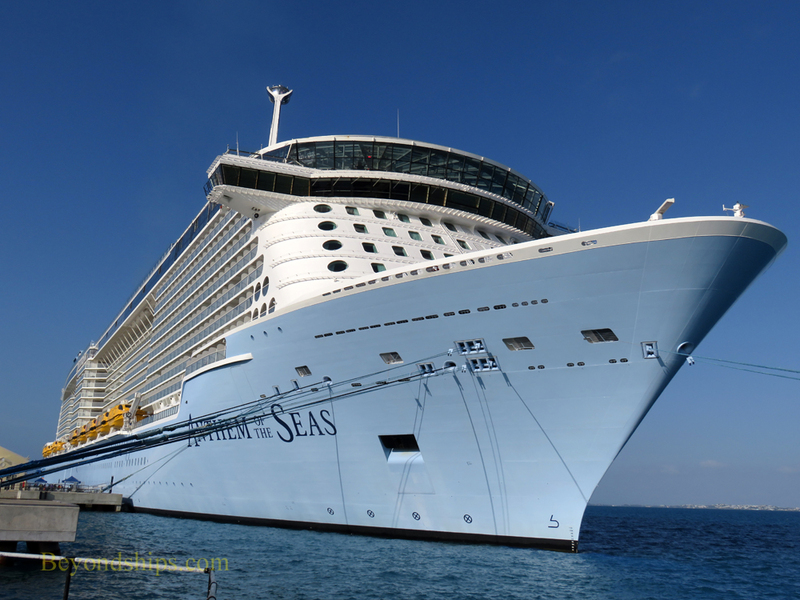 Royal Caribbean attempted to satisfy these concerns with a modified system of Dynamic Dining that was similar to the system used on the Disney Cruise Line ships but this failed to satisfy the traditionalists. In its place, Royal has instituted the same system that it uses on its other ships. Guests can opt for either the traditional passenger ship system with assigned tables at either the early or the late seating or they can opt for a flexible dining system in which the guest can come to the restaurant at any time the restaurant was open. For the latter system guests are encouraged to make reservations beforehand but the system also tries to accommodate walk-in guests. Anthem was not built like a conventional cruise ship with one large main dining room. As discussed above, it has four separate main dining rooms. Two of these have been assigned to the traditional dining system (Grande and Chic) and two are assigned to the flexible dining system (Silk and American Icon). All four restaurants use the same menus. I was surprised to find how well the system works on Anthem. I opted for flexible dining and gravitated toward the Silk restaurant at first because I liked the décor better than the other dining room but as time went on I came to know the staff at the door as well as several of the servers. The staff at the door were always pleasant but serious about finding each guest a table and keeping waiting time to a minimum. An effort is made to seat each guest with the same server that they have had earlier in the voyage. (One of the most frequent criticisms of Dynamic Dining was that a guest did not have the same server throughout the cruise). For the most part, this effort is successful but at times all the tables in a particular server's area are taken. As a result, I came to meet several of the servers in Silk and found them all to be hardworking and affable. ​One of the things that I liked about Dynamic Dining was the variety it offered - - you had four restaurants each with a different menu. Now, all the restaurants have the same menu. It is not themed as in the past but rather a range of items from different cuisines. Some classic items (e.g. salmon, French onion soup) are available throughout the cruise but most change each night. I was pleased with the variety offered on Anthem's menus. (See Anthem menus page). Many of the items were familiar favorites such as prime rib and lasagna but there were also some intriguing different offerings. The menus reminded me of the new enhanced menus that I had tried on Harmony of the Seas a few weeks earlier. Of course, it is a matter of personal preference but I found the offerings tasty - - certainly competitive with other cruise lines. Reflecting the taste preferences of the majority of North American cruisers, the offerings were not spicy. For those of us who prefer some spice, fresh ground pepper is available to bring out the flavors. When I asked, the server was also able to bring me red pepper flakes. Not surprisingly, Anthem's new system faces the same challenges that face other ships that use the same system. The majority of guests in North America like to eat early and so there is great demand for the early seating. For the same reason, the dining rooms with flexible dining are busiest between six and seven thirty. Also, when a major show finishes in one of the entertainment venues, a large number of guests will descend upon the flex dining rooms at the same time. However, the staff manages to clear the lines fairly quickly. Breakfast and lunch (sea days only) in the main dining room are essentially unchanged from my last voyage on Anthem. Both are open seating. The Grande is the only one of the four main restaurants listed in the daily program as open for these meals but depending upon demand, Chic is also used. Guests can order off a menu or take items from the buffet tables. The salad bar at lunch time is excellent. You tell the person at the buffet counter which of the many ingredients you want in your salad and he or she makes the salad to order. Anthem also has several extra-tariff specialty restaurants. On these cruises, I went to two of them - - Jamie's Italian and the Chops Grille. Jamie's was created by British celebrity chef Jamie Oliver and first appeared on Quantum of the Seas. The menu is Chef Oliver's take on a number of traditional Italian favorites. It is a more informal venue than the Giovanni's Italian-themed restaurants on some of Royal Caribbean's other ships. The choice of spices and ingredients also renders the flavors different than you may be used to from other Italian restaurants. Nonetheless, the food is very tasty and the venue is quite popular. The service was also very good. Chops Grille is Royal Caribbean's steakhouse. It is not fine French-style dining but Chops reliably delivers an enjoyable premium meal. (See earlier review). On cruise ships, dining and entertainment go hand in hand. If you change one, it affects the other. For example, guests do not spend as much time in the dining room under the conventional system than they did under Dynamic Dining. Consequently, they are out looking for more things to do in the evenings. Anthem was able to meet this challenge. Anthem has two major entertainment venues, each with its own cast. In the Royal Theatre, the cast performs a full-length rendition of the West End musical “We Will Rock You.” The cast and the production values are thoroughly professional. However, the show revolves around Queen's music and thus if you do not like Queen's music, you will not be happy. Also, a problem that all ships with a high number of repeat passengers face is that there is a limited number of times that people want to watch a show that has a plot regardless of how good it is. As it turns out, it is easier to watch a plotless revue multiple times precisely because such shows do not require intellectual engagement. The other production show performed by the theater cast is “The Gift,” developed in-house by Royal. Again, the performance and the production values are first rate. However, I find this show rather dark and uninteresting. Two 70 is a unique entertainment venue that spans the entire stern of the ship and cuts through several decks. During the day, its enormous windows provide unparalleled views of the sea. In the evenings, the windows are covered with video screens and it becomes the Vistarama. Sections of the floor can rise up and aerialists can emerge from the ceiling. The seating is somewhat like an amphitheater with terraces of cushioned benches leading down to the stage. There is also a more conventional balcony. The cast of Two 70 perform “Spectra's Cabaret.” This is not a conventional cabaret. It is also not a show with a discernible plot. Rather, it is a string of performances by singers, dancers, musicians, and aerialists vaguely hosted by a fantasy-like figure. All of this is enhanced by the Vistarama and the rooms cutting edge sound system. The atmosphere is psychedelic. I found that once I stopped trying to figure out what was going on and just let the performances and effects flow over me that Sprectra's is quite enjoyable. It is best to sit as close to the front as possible so that the show and the effects are happening all around. It loses much of its interest if you sit in the back and just watch it as in a regular theater. On these cruises, there were quite a lot of visiting entertainers performing mostly in the theater. These included comedians, musicians, magicians and other variety acts. Somewhat unusually, the visiting entertainers were not the same on both cruises. The standout was the Beatles Celebration, a tribute band, who performed a lively dance party in the Music Hall and a concert to a packed Two 70. In addition to the main shows, the entertainment included numerous activities with the cruise staff, dance parties, live music in the various bars ad lounges, movies, the “Love and Marriage Game,” and that Royal Caribbean favorite - - The Quest. The Vistarama was also used for shows involving scenes of natural beauty as well as visually-interesting animations. There was no enrichment program. The experience on Anthem's longer cruises would be enhanced by a program similar to the Carnival Journeys program being used on the longer Carnival cruises. (See article). Another area where the entertainment could be improved is the in-cabin television. The free channels are mostly Royal Caribbean advertising in various forms with a few channels showing old sitcoms and old movies. The news offerings are also quite limited. Anthem's television offerings fall short of the wide selection offered on Princess Cruises' most recent ships. Anthem offers two types of internet connections. One type is the “Surf and Stream” and behaves much like high speed internet connections on land. The other less expensive version is “Surf.” I found Surf to be quite fast during days in port but that it slowed down as the passengers returned to the ship from their time ashore. It was also slow most of the times I used it at sea. The Surf and Stream was more satisfactory in terms of speed. I experienced dropped connections with both Surf and Stream and Surf. Turning to accommodations, on these cruises, I had a balcony cabin. I liked the contemporary décor, the large shower, and the large comfortable bed. Furthermore, I was pleased with the attention to detail such as the night light in the bathroom and the quality of the furniture. It was particularly nice to open the balcony door when the ship was in the Caribbean and let the warm breezes drift through the room. ​Nautically, Anthem handled well. Sailing out of New York in the winter, one can expect some rough seas. However, on both of these cruises, Anthem did not encounter any weather until homeward bound roughly off the Bahamas. Captain Henrick Sorenson changed the ship's course on both occasions to minimize the time that the ship was affected by this weather. Although there was some movement of the ship, the vast majority of the guests were still out and about in the public areas enjoying themselves.